I’m leaving tomorrow morning on a little trip that will take me all the way across Wisconsin, into Minnesota and back. Along the way, I’ll get caught up with friends I haven’t seen for a while. Or in the case of Whiteray and the Texas Gal, friends I’ve met only online and never in real life. The last stop will be a reunion with my friend Terry, whom I’ve known for 30 years. He moved away from here earlier this year to pursue a better opportunity in the news business. Terry is missed for many reasons, but foremost because we both dig music. He hepped me to plenty of good stuff, and for that I am ever grateful. Life takes friends in different directions. You don’t hang out like you used to. You don’t go on new adventures. You don’t get exposed to new things. That’s life, but I miss those things. When I wrote about the Bob Welch song “Hypnotized” in the wake of his passing earlier this month, I mentioned that Fleetwood Mac’s “Mystery To Me,” the album with “Hypnotized,” was one of the first I bought when I got back into buying vinyl records a few years ago. Truth be told, I bought that album solely for “Hypnotized.” I’m not at all familiar with the rest of it, even though I must have heard some of its cuts on the free-form radio of the early ’70s. So, considering Terry’s recommendation, I ripped it. Tonight’s side on The Midnight Tracker, materializing from the sweet blue haze of time, features “Miles Away,” a song about getting away from it all. 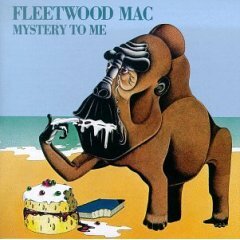 “The City,” “Miles Away,” “Somebody,” “The Way I Feel,” “For Your Love” and “Why,” Fleetwood Mac, from “Mystery To Me,” 1973. This is Side 2. It runs 23:23. The first three cuts were written by Welch. “The Way I Feel” and “Why” are Christine McVie compositions. “For Your Love” is a cover of the Yardbirds tune. It replaced another Welch song late in the going. Some inner sleeves, including mine, show “Good Things (Come To Those Who Wait)” as the second-t0-last song on this side. Welch eventually re-recorded his song and released it as “Don’t Wait Too Long,” the second-to-last song on his “Three Hearts” LP in 1978. This was the third of four Fleetwood Mac albums with Welch. He left the group after “Heroes Are Hard To Find” was released in late 1974.